From the Hancock County Courthouse, go east on Hwy 15 for 1.5 miles. Turn right on Cody Johnson Road (Road 222) and go 5.6 miles. Turn left on Barnes Road (Road 226) and travel 0.4 mile. 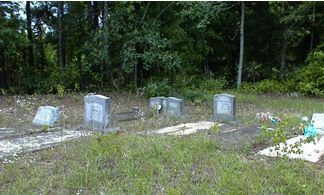 The cemetery is on the left about 50 feet from the road. On same headstone as E. V. Barnes. On same headstone as Ezell Barnes.